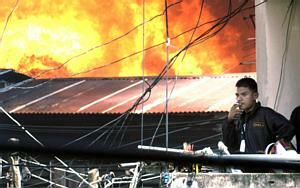 A great fire is now raging in downtown Bangkok ... so far more than 200 homes have been destroyed. BANGKOK: -- A massive fire has broken out in a poor neighbourhood of Thailand's capital, Bangkok, forcing residents to flee into the streets with their belongings. The BBC's Kylie Morris in Bangkok says the slum area is located near a wealthy neighbourhood, housing many embassies - no damage to these has been reported. The area is near the Australian and German embassies and several five star hotels, says Reuters. Some 200 two-storey wooden houses were ablaze, local radio said. 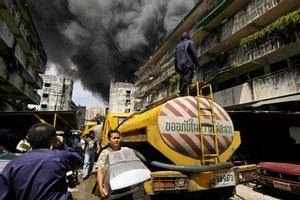 "The flames look huge but they seem to be confined to one spot," said Sima Srimueng, a houseworker who lives nearby. "All the smoke is scary." Fire trucks arrived at the scene, where desperate residents could be seen carrying out the contents of their homes, making it difficult for fire trucks to navigate the narrow streets. Residents were spraying homes with water from garden hoses to stop the fire from spreading. There is no word on any casualties so far, but fire trucks and emergency vehicles are arriving at the scene. The fire raced through a slum in downtown Bangkok on Friday, snarling traffic and spewing plumes of black smoke over embassies and five-star hotels in the area, officials said. There were no initial reports of injuries. Some 50 houses in the densely populated Suan Plu neighborhood caught fire by mid-afternoon, said Sathorn district administrator Prasarn Bamrungphan. There are about 200 wooden houses and corrugated steel shacks in the area. Firefighters had difficulty reaching the area and feared strong winds could spread the blaze to nearby buildings, including a police and immigration center and luxury apartment complexes. There are embassies and five-star hotels in the area, but not in the immediate vicinity. Police ordered the evacuation of two five-story apartment buildings where officers live, one of which had caught fire, firefighter Col. Wichai Krawatanasiri said. "The fire is getting worse and has engulfed a police apartment building," he said. Hundreds of people, some of them weeping, watched from sidewalks as huge plumes of black smoke rose above the neighborhood. Some residents ran from their homes clutching personal belongings such as television sets, computers and pets. "We didn't have time to get anything out," said Cang-on Porang, a 48-year-old housewife. "The smoke just started rising." Chaingam Kiewsaad, 33, said she fled her house when the fire spread nearby. "It's probably all gone," she said, sobbing. "I couldn't get anything out. Even my car is in there." PPS: Oh My God! The fire is now perilously close to the apartment building in which the Patpong Corkscrew Club (PCC) had its first meeting. BANGKOK, April 23 (AFP) - A huge fire raged out of control through a densely populated slum area in central Bangkok Friday, with hundreds of firefighters battling the blaze near the Australian and German embassies and several luxury hotels, officials and witnesses said. The fire engulfed up to 700 wooden houses in the Tungmahamek slum area, home to about 7,000 people behind Bangkok's Sathorn business district, and threatened to spread beyond the congested region as strong winds fanned the flames. A large plume of black smoke was seen from several kilometres away rising hundreds of metres into the air. "As of now, we have not been able to control the fire," Sathorn district director Prasan Bumrungpunt told Bangkok radio from the chaotic scene of the blaze nearly two hours after it began. "All of the wooden houses in the slum have burned down," he said, adding that some 600 to 700 shanty-style houses had been in the area. Over 100 firetrucks had converged on Tungmahamek, and several ambulances were standing by on the slum's periphery, but the vehicles appeared unable to navigate the narrow alleyways, an AFP photographer witnessed. He saw hundreds of residents clogging the narrow streets, their arms full of valuables, or dragging possessions such as refrigerators or gas cylinders out of the fire's reach. Several volunteers and residents were also seen throwing buckets of water onto flaming rooftops and escorting people to safety. Metropolitan police spokesman Colonel Phanurat Meepien said the fire had spread to the grounds of a nearby police station and engulfed at least 50 police apartments. Despite the scope of the blaze there were no immediate reports of deaths or injuries. "It's too early to know if there are any casualties," he said. PPPPS: A different kind of fire is getting out of control down in the southern provinces of Thailand, near the Malaysian border. This fire is more dangerous as it is being fed by religion. Unidentified assailants last night carried out a series of almost simultaneous attacks on more than two dozen official targets in Narathiwat province, torching eight schools, a church, a monastery, 20 public phone booths and two government offices. Ten suspects were later arrested on suspicion of involvement in the arson attacks, which were the most well-coordinated since the January 4 raid on an Army camp in the same southern province. In total, eight schools in four districts were set ablaze, all at about 7.30pm. Buildings in Ban Koksumoh School and Ban Thungtohdang School in Muang district were severely damaged, said Pol General Woradee Karawanan, chief of Narathiwat’s Muang district. Ban Yabi School, which is one kilometre from the King’s southern retreat, Thaksin Ratchaniwet Palace, was also torched, another senior officer said. It was only slightly damaged as villagers rushed to kill the fire. Twenty public phone booths in Sungai Kolok district were torched at about the same time the schools were burned, police said. A monastery in Janae district, a church in Sungai Kolok district, an office of the Tambon Administration Organisation in Sungai Padi district and a healthcare centre in Waeng district were also set ablaze. The attacks took place a day before Interior Minister Bhokin Bhalakula and representatives from the National Security Council were due to visit the deep South today. This is the second large-scale attack since January 4, when assailants stormed the Narathiwat Rachanakarin Camp, making off with more than 300 weapons, killing four guards and torching 21 schools. "The incident closely resembles the January 4 raid. The attack was begun at the same time," Woradee said. Violence has continued unabated since the January 4 attack. State officials and places symbolising state power have been the major targets. The government’s use of heavy-handed tactics to try to curb the violence has been blamed for exacerbating the situation. Earlier yesterday, one man was shot dead and two others were seriously injured in separate attacks in the two other southern provinces. In Yala’s Yaha district, an Army private and a defence volunteer were shot and seriously wounded in a morning attack. Private Sitthichai Jaithaharn, 23, and defence volunteer Malaseng Yamu, 38, were attacked by two motorcycle-riding gunmen while leaving an Army base by motorcycle. Sitthichai was shot three times in the back and Malaseng suffered a bullet wound to his right arm, police said. In Pattani’s Nong Chik district, Aroon Chusai, 50, a civilian, was shot dead by two gunmen on a motorcycle at about noon, police said. The attacks might have been the result of personal conflicts rather than the work of militants, they said. 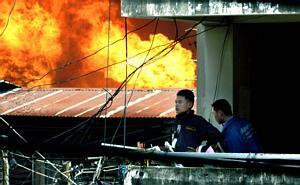 Meanwhile in Bangkok, a police source said investigators have completed gathering evidence on the January 4 raid. It will be submitted to prosecutors today, the source said. The investigative team led by Deputy Police Commissioner-General Kowit Wattana met yesterday to review the case. Investigators believe 31 people were involved in the raid on the depot in Narathiwat’s Joh I Rong district, the source said. The suspects have been divided into three groups: those who allegedly raided the camp, those who allegedly torched the schools and those who allegedly blocked soldiers from pursuing the attackers, the source said. Police have so far arrested 18 of the 31 suspects. They include Najmuddin Umar, a Thai Rak Thai MP from Narathiwat. The source said some suspects would become state witnesses. Police have beefed up security around several foreign diplomatic missions after the South Korean and Pakistani embassies received letters this week threatening terrorist attacks this month against countries supporting the US-led operations in Iraq. On Wednesday, the South Korean Embassy received a letter by regular post from the Yellow-Red Overseas Organisation, a previously unheard of group. It warned of attacks on major facilities in Australia, Japan, Kuwait, Pakistan, the Philippines, Singapore, South Korea and Thailand between last Tuesday and next Friday, a Korean diplomat in Bangkok said. The letter, typed in English, is being examined by Thai authorities, first secretary Ryoo Jung -young said, adding that the embassy was operating normally. "This is a serious problem. They threatened embassies, air flights and other interesting places [in the eight nations]," Ryoo was quoted by AFP as saying. After being notified of the letter Seoul immediately requested increased security for its mission and the Korean community here, he said. The Pakistani Embassy received a similar warning letter from the same group on Monday, police said. "The Pakistan Embassy was the first to receive the threatening letter, on April 19," a senior Special Branch officer said. "It was forwarded to the National Security Council for investigation, and later authorities found that the South Korean Embassy received the [same] letter on the 21st," he said. The threatening letters precede a visit by Pakistani Prime Minister Zafarullah Jamali. Jamali is due in Bangkok at the end of next week for talks with Prime Minister Thaksin Shinawatra. Metropolitan Police chief Lt-General Thanee Somboonsap ordered security tightened at the South Korean Embassy, on Thiam-Ruammit Road in Huai Khwang, after it alerted him about the letter on Wednesday night. Police from Lumpini and Bang Rak stations were instructed to step up patrols at offices of foreign airlines, particularly Korean Air, Thanee said. Foreign Minister Surakiart Sathirathai said necessary precautions were taken after the letter was reported to authorities. "Embassies are entitled to seek extra security, and the Thai government cannot ignore those requests. We have ordered intelligence and security increased around the embassy," Surakiart said. A South Korean foreign ministry spokesman said from Seoul that the letter was addressed to "all US alliance forces in Iraqi operations", and eight countries were mentioned by name. "We are looking into the credibility of the letter from various points and also collecting additional information," Kim Sung-chul said. "We have also been in contact with all related countries." A security alert imposed in South Korea last month ahead of the general election has been extended until the end of the month in response to the threat, while South Korean embassies overseas have also been asked to reinforce security, he said. In January, South Korean authorities boosted security at airports after Korean Air's Bangkok office received a letter from an unknown group identifying itself as the "Anti-Korean Interest Agency" and warning of attacks on flights to the country. Eight days earlier the group had warned Seoul's embassy in Bangkok of attacks on South Korean assets and aircraft in Southeast Asia. The threat of terrorist attacks hit the Thai stock market yesterday like a bombshell, sending it down 2.2 per cent and below the psychological 700-point barrier. The market started the day with a marginal rise before mounting concerns over security overwhelmed the recent generally positive mood among investors. The market fell after South Korea's embassy in Thailand announced it had received letters threatening attacks on Asian countries involved in the US-led war on terrorism. Warnings from the United States that crowded shipping lanes and financial centres in Asia are targets of terror attacks, coupled with a Thai-language newspaper's report about bomb threats at Had Yai Airport, also cast a shadow over the market. The Stock Exchange of Thailand (SET) index tumbled and finally settled at 690.9 points under brisk turnover of Bt22.47 billion. The SET was the hardest hit in the region. The benchmark South Korean Composite Stock Price Index closed down 0.64 per cent at 924 points and Hong Kong's Hang Seng index fell 0.5 per cent to its lowest level of the year. The selling spree was heavy in blue-chip stocks, particularly among those that have enjoyed strong gains recently. PTT Plc was off 3.2 per cent at Bt152, PTT Exploration and Production Plc plunged 3.5 per cent to Bt278, Siam Cement Plc fell 2.5 per cent to Bt230, Bangkok Bank was down 2 per cent to Bt98 and Thai Airways International Plc slid almost 3 per cent to Bt65. Adipong Puttarawigrom, SCB Securities vice president and head of the brokerage's investment strategy department, rushed to soothe market jitters, saying investors had overreacted to the news. A self-proclaimed "anti-American" group calling itself the "Yellow-Red Overseas Organisation," sent a one-page letter to the South Korean Embassy in Thailand, announcing it would launch attacks from April 30. The group threatened to attack diplomatic compounds, airlines and public transportation systems in seven countries - South Korea, Japan, Thailand, the Philippines, Singapore, Australia and Kuwait. Investors also fretted about growing speculation that Prime Minister Thaksin Shinawatra would dissolve Parliament and hold a snap election, Adipong said. "I believe that the government will not dissolve Parliament before approving the budget in August," said Adipong. The steep fall in the stock market is a good opportunity for medium to long-term investors to scoop up stocks, he said. He predicted that the SET would soar to 760 points within one month and 900 points in the long run. "Right now people are concerned about a snap election and terrorism after South Korea asked for stepped-up security at their interests in Thailand," Wiriya Lappromratana, an analyst with Kiatnakin Securities, told Reuters. An analyst at a local brokerage said investors rushed to cash in and keep themselves at bay to digest the tense situation shrouded by fears of violence. BANGKOK (Reuters) - A fire that raged for three hours on Friday through a Bangkok slum near the Australian and German embassies destroyed thousands of people's homes, officials said. The blaze, which sent a pall of thick, black smoke towering into the sky, broke out in a densely populated area packed with wooden homes. "When I saw the flames, I just ran. I've got nothing left," said one distraught resident fleeing the flames. A five-story block of flats next to the slum was also destroyed. "We need to find shelter for 2,000 to 3,000 people left homeless tonight after we have put out the fire," Prasarn Bamrungpan, chief of Bangkok's Sathorn District, told Reuters. Desperate residents could be seen spraying homes with water from garden hoses to stop the fire from spreading, or emptying the contents of their homes in a bid to save a few possessions. Officials said there had been no reports of casualties and no clues to the cause of the blaze. 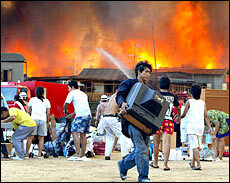 Families flee with their belongings as flames emerge from the Tungmahamek slum area of Bangkok. BANGKOK (April 23) - A massive fire raced through a slum in downtown Bangkok on Friday, snarling traffic and spewing plumes of black smoke over embassies and five-star hotels in the area, officials said. There were no initial reports of injuries.